Yes, it’s porphyry, a dark, reddish-purple speckly stone, and this room, for the many who enter and ooh and aah and glittering Hercules, is another moment of material illiteracy. Just as a Catholic spots John the Baptist by his hairshirt, and a fashionista a Gucci handbag by whatever alien cues its curves contain, so from the Roman Republic to Napolean a European knew what porphyry implies: Wealth, Technology, Empire, Rome. Porphyry has become a generic term for igneous rock containing large spots (crystals), but the source of the name is the Greek word for purple, and the purple form is the true original. This is referred to as Red Porphry, Purple Porphyry, or, most aptly, Imperial Porphyry. 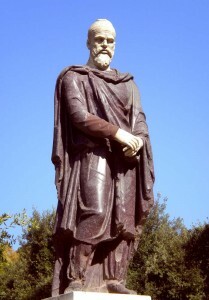 The Imperial Porphyry found in Italy came from a single mine in Egypt, the Mons Porphyrites. It was imported by the Romans as a decorative accent stone, for use in tiled floors, as colored columns, or occasionally carved into a vase or sculpture. Its color invokes Royal Purple, but is also very close to the color of the fabulously expensive shellfish-based purple dye which produced the purple stripe which marked the tunics and togas of the Senatorial class. This also dyed the completely purple toga worn by those who occupied the rare and severely powerful office of Censor, a special official created only on occasions, whose task was to examine the state of the Senatorial families and judge which were still worthy of office and who should be removed or added to the roster of Rome’s leading citizens. 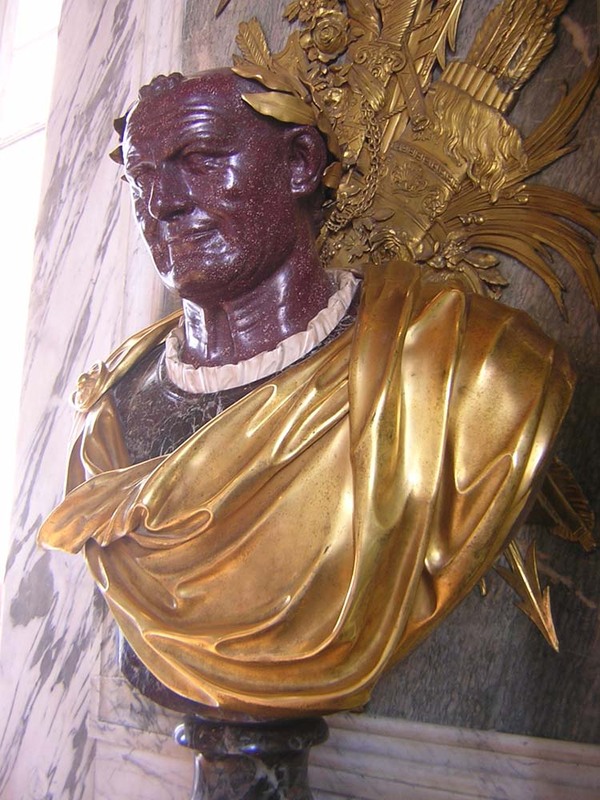 A Roman statue with a purple toga rendered in porphyry, from the Boboli gardens behind the Medici’s Pitti Palace. Several Caesars held this special office, so purple, and porphyry, and as their palaces became more opulent it became increasingly an imperial symbol. In Constantinople, once the capitol moved in the late empire, the imperial palace contained an entire room covered in porphyry, and this was traditionally where empresses gave birth, giving imperial princes and princesses the title Porphyrogenos, “born to the purple”. Porphyry is extremely hard, also dense and heavy. Even lifting a substantial hunk of porphyry is a great feat, let alone transporting it by ship from Egypt. It is also so hard that it takes very strong, well-tempered steel to cut it, and even then, achieving any great degree of precision is very challenging. The Romans had steel good enough, but it too was lost in the Middle Ages, making Roman porphyry artifacts not only symbols of the Caesars but of the impossible godlike skills of the ancients, which their weak successors could only marvel at. It was physical, recognizable proof that the Romans could do the impossible. In addition, the location of the mine in Egypt was lost around the fourth century AD, and not successfully rediscovered until 1823. 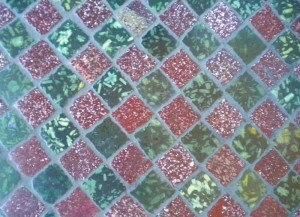 Imperial Porphyry has a cousin, green porphyry, or Lapis Lacedaemonius, commonly called Serpentine. It is just as hard, coming from a mine near Sparta (or near the modern Greek town of Krokees). It is speckled too though often with larger speckles, many somewhat rectangular or X-shaped. 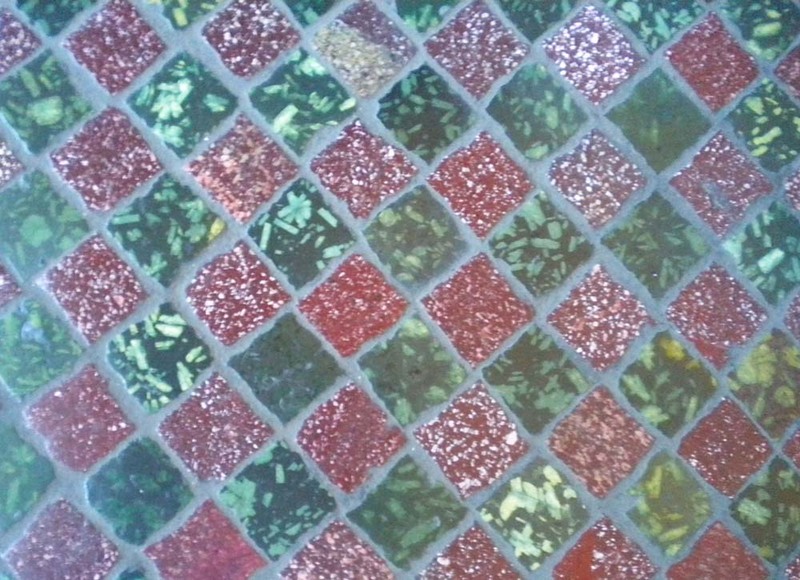 The combination of rich green and purple, usually set in a white Italian marble background, was an extremely popular decorative element seen all over Rome, in the houses of Rome’s imitators, and especially in palaces and churches which re-used floor tiles looted from Roman sites. Porphyry ornaments the floors of Rome’s greatest churches, with the size and density of porphyry among the framing stones increasing toward the altar. 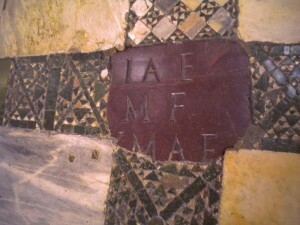 The header at the top of this very blog shows a porphyry section from the floor of the Sala della Disputa, the frescoed room in the Vatican which hosts Raphael’s incomparable School of Athens, while the Sistine Chapel Floor (not a phrase you hear often enough) completes the opulence of the other decoration with a dense decoration more purple than white. In the Middle Ages, then, porphyry meant Rome, specifically the lost power of the Caesars who could reach across oceans and achieve impossible feats. Anywhere porphyry appeared it was a Roman relic, and anyone who had it could claim thereby to be an inheritor, in some small way, of that lost Imperium. Porphyry also came, over the middle ages, to symbolize Christ (reddish purple = blood), but in the Middle Ages everything came to represent Christ, from griffins and unicorns to pelicans and pomegranates (no, it’s totally not a co-opted pagan symbol, why do you ask? ), so what distinguished porphyry from the zillion other things that represented Christ was still its imperial connection and its technological unachievability. 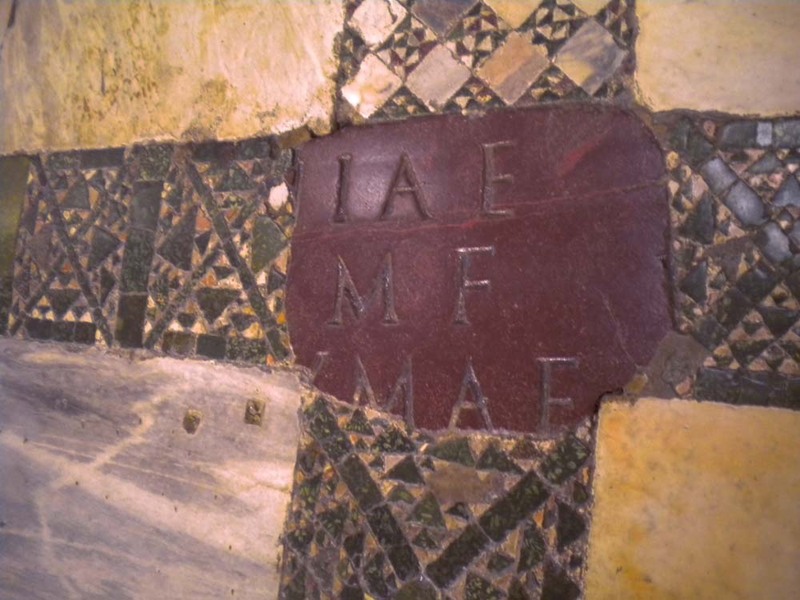 Re-purposed porphyry in a Church floor, with remnants of its Roman inscription. Thus everyone who’s everyone wanted porphyry, and if you wanted it, you had to steal it. 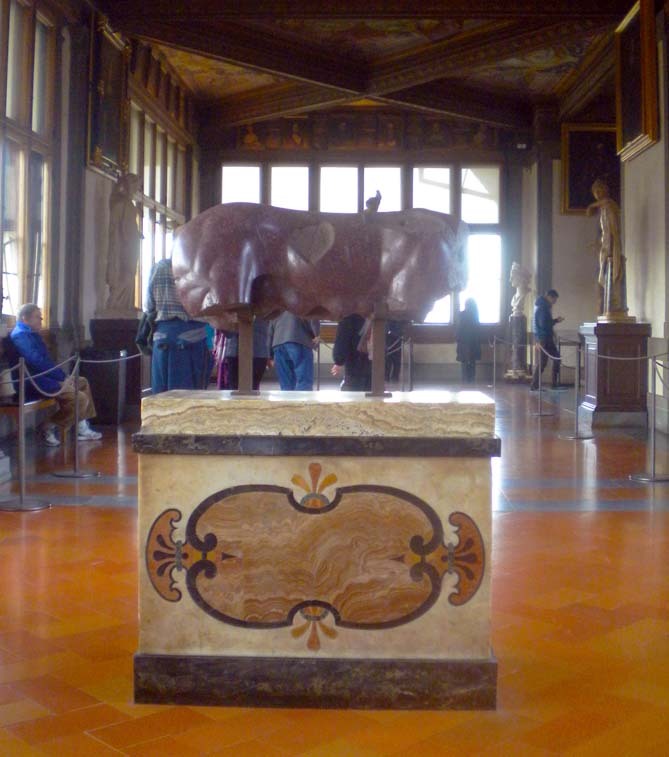 The only porphyry in Europe lay in things the Romans built, so every prince and republic and sculptor who wanted this symbol of Roman power had to steal it from the source. 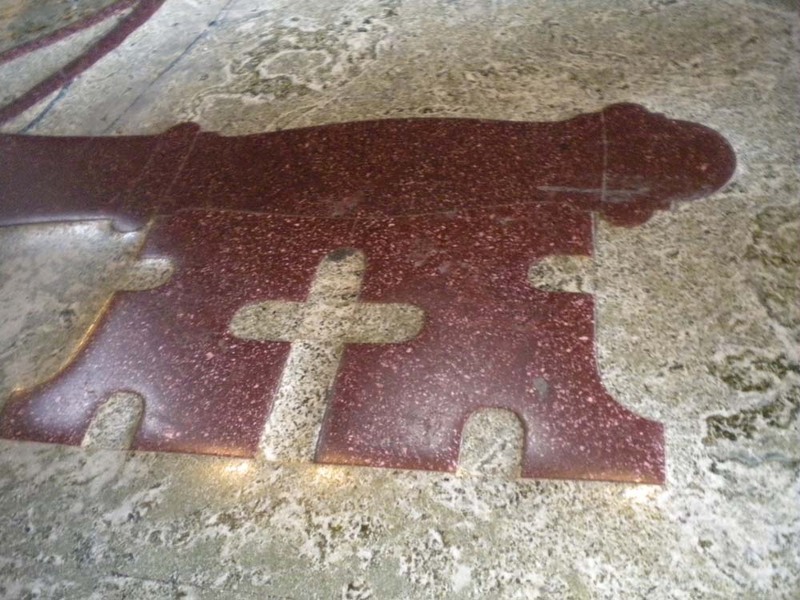 Want to put in a nice porphyry floor for a Church? Loot it from a Roman temple. Want to advertise the imperial majesty of Mary Queen of Heaven? Make the altar out of an old, repurposed porphyry sarcophagus. If a pope wanted porphyry columns for his tomb, he had no better source than to go to some surviving Roman temple (say, the Pantheon…) and rip out the porphyry, perhaps if he’s polite substituting some less valuable stone to keep the looted edifice from falling down. Some places already had porphyry brought there by the Romans, and in these cases it was proudly displayed as proof of the noble Roman origins of a town or province. 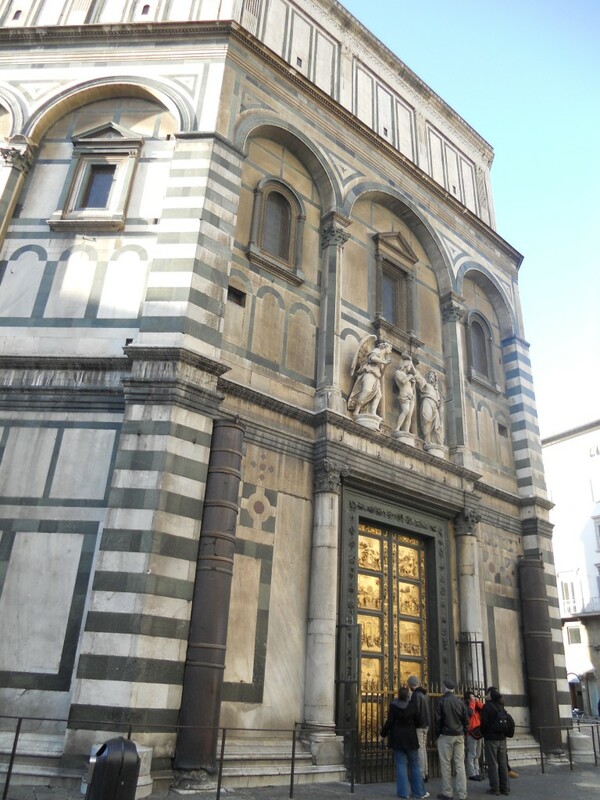 Even in Florence, on the baptistery which is the literal heart and center of the city, the gilded Gates of Paradise are still flanked by two old, cracked and mended, asymmetrical dark reddish columns, built into green and white facade despite a complete chromatic mismatch. So old and dull are they that many don’t even notice them upon first or even third visit, but these are porphyry, relics of the Roman-era Church of Santa Reparata, or its predecessor, preserved and re-used here as proud proof of Florence’s Roman roots. Porphyry sculpture was even more impressive than a tile or column, since working such an adamantine substance into complex shapes required immense time and skill. Diamond was rare and valuable and not a practical tool for trying to make a large chisel to work large stone, but short of diamond the only means to shape porphyry was to rub it against another piece of porphyry for a very long time, grinding both down, a clumsy, labor-intensive and imprecise technique. Many, especially the Medici family, poured funds and efforts into researching ways to make a metal sharp enough to carve porphyry, or a solvent capable of weakening it, in hopes of adding this to their list of resurrected Roman achievements. 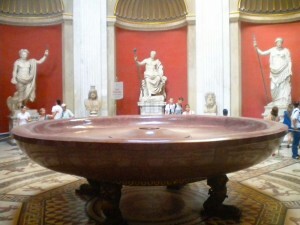 Even before they succeeded, however, possessing a Roman porphyry sculpture was an even grander boast than possessing simple tiles, and at last now we can understand why, in the Uffizi Gallery, where the great Roman sculpture treasures of the Medici are still housed, one comes around the corner to the very center of the U-shaped gallery, expecting to see in the center some exceptional masterpiece, an Emperor or bold Athena, one sees instead the mangled, limbless torso of an animal. Look again: those hips, those hanging teats. This is the mangled, limbless torso of a porphyry she-wolf, the symbol of Rome herself. 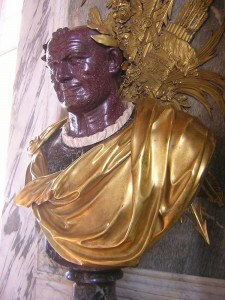 A porphyry bust at Versailles. Naturally, the greatest concentration of porphyry lay (and lies) in and around Rome itself. The farther you are from Rome, the scarcer (and more impressive) porphyry becomes. 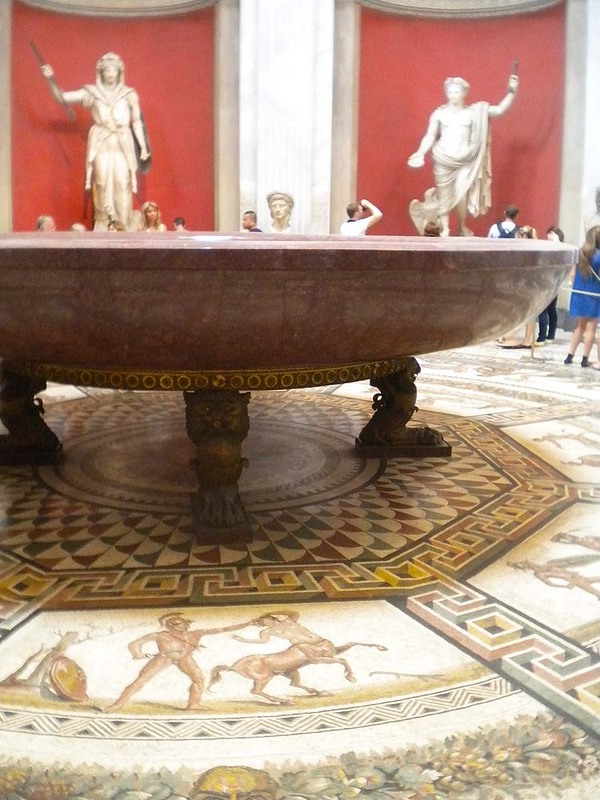 Florence had a couple columns and the odd basin, but for more porphyry they had to buy or steal from Rome, or elsewhere. 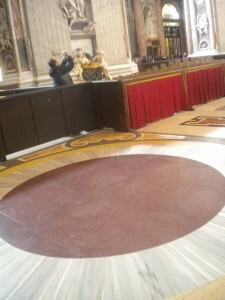 The Venetians carried off large pieces of porphyry from Constantinople when they looted it, and still display them proudly as pulpits on either side of the main alter in San Marco. Porphyry in northern Italy is comparatively scarce, so a Venetian palace with a few roundels in its facade makes a real statement. Even as far as France, when Louis was decorating Versailles, porphyry was scarce indeed, but what few busts and vases he got hold of went straight into the best places: the throne room, and the Hall of Mirrors where every visitor would see, and understand, Louis = Caesar. 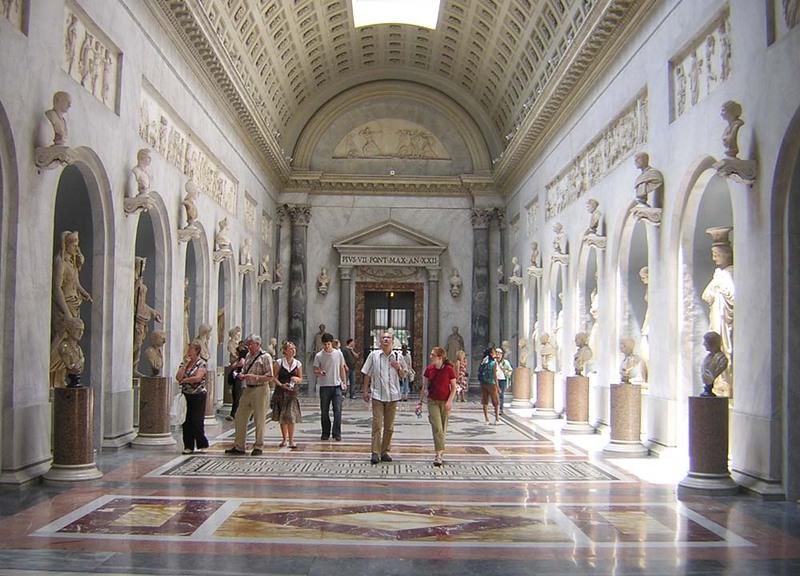 The pope always wins the Who-Has-The-Most-Porphyry Competition, and the Vatican is its grand display case. 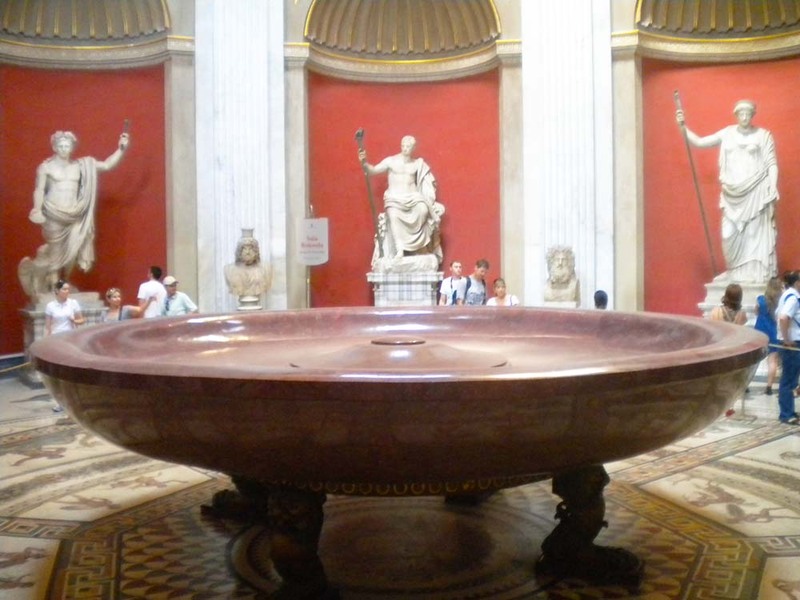 The staggeringly enormous porphyry basin in the round sculpture room in the Vatican palace is referred to as Nero’s bathtub, and is the largest piece of porphyry I have ever seen; I would not be surprised to discover it is the largest in the world. 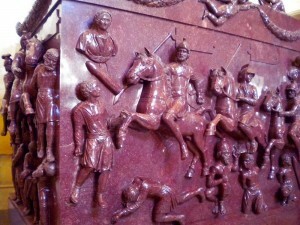 One is generally still reeling from trying to imagine the staggering cost and difficulty of creating and moving such an object, when in the next room one encounters an even more impossible vision: two enormous solid porphyry sarcophagi, both taller than a standing person, and covered in deep relief carvings of horsemen, prisoners and acanthus leaves. This is Rome indeed. Specifically, these are the sarcophagi of the women of Constantine’s family, including the tomb of his mother, Helen, or more specifically Saint Helen, who traveled to the holy land and brought back the True Cross and the Lance of Longinus and… at least one other major relic, but I can’t right now remember whether it was a nail or part of the Crown of Thorns, or perhaps that piece of the Holy Sponge they have in Rome… (Spot the Saint moment: Helen’s attribute in art is that she carries the cross.) Regardless, the two tombs have no Christian imagery, just the most Roman of Roman decorations, horsemen leading vanquished prisoners for Helen, and for the other fertility images. In deep, impossible relief. 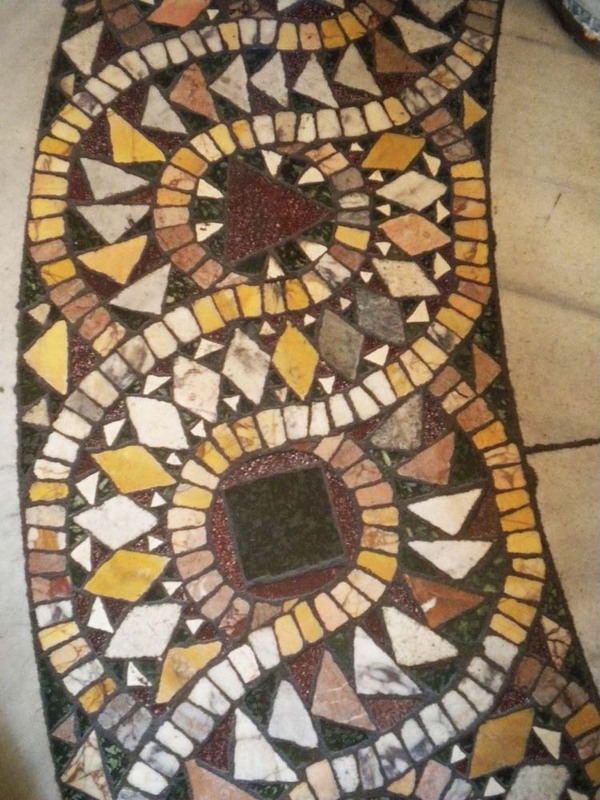 In an era when it was a substantial feat to scrape two looted pieces of porphyry into sufficiently matching shapes to make them seem symmetrical in a floor pattern, there is no purer proof of the godlike power of the ancients. After that, there is just too much, and every further encounter with porphyry in the Vatican labyrinth feels like one, two, three, five, ten too many. That guy should be taking a photo of the porphyry! 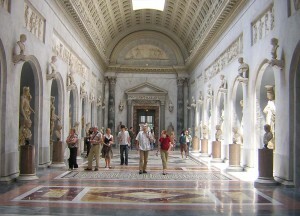 St. Peter’s is just as much a showroom for porphyry, with columns, tiles, tombs. Every purple object that, from a distance, makes you think “is that porphyry?” turns out to be the genuine article. And it’s worth keeping in mind that, except for the most modern pieces, they’re all relocated chunks of what were Roman temples scattered around the city from the Caesars’ days. 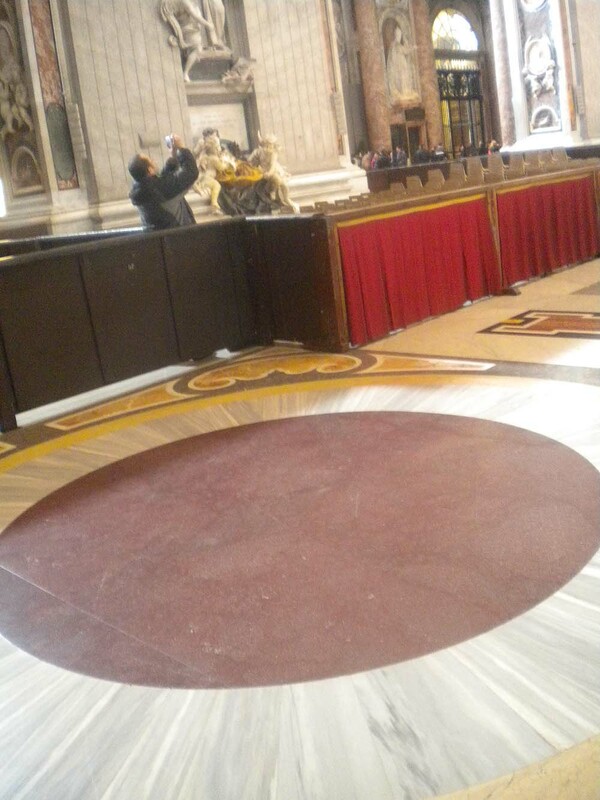 One large porphyry round in the floor close to the entrance is supposed to be the stone from the original St. Peter’s on which Charlemagne was crowned the first Holy Roman Emperor (and successor to the Caesars) on Christmas day, 800 AD. It’s just inside the entrance in the exact center of the Church, sort of balancing the altar, secular power facing sacred. Perhaps my favorite piece of papal porphyry, though, is this set of porphyry keys carved and set into other stonework in the threshold of the Church, so every visitor who enters walks across them. Most ignore them, but in the pre-modern world one glance at heraldic papal keys in porphyry spells a very special kind of awe: not only does the pope have Porphyry but apparently he has the power to carve it into a Christian shape. Clearly he is Rome’s successor. 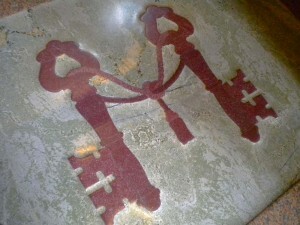 With so many visiting feet for so many centuries, the papal threshold keys are also the best proof I know of the extreme hardness of porphyry, since the stone around them is worn down by more than a centimeter, while the keys stick up, unharmed by the tread of millions. The Florentine Museum of the History of Science has examples of scientific instruments and grinding stones fashioned from porphyry, chosen for its rigidity and inelasticity as well as for its opulence. 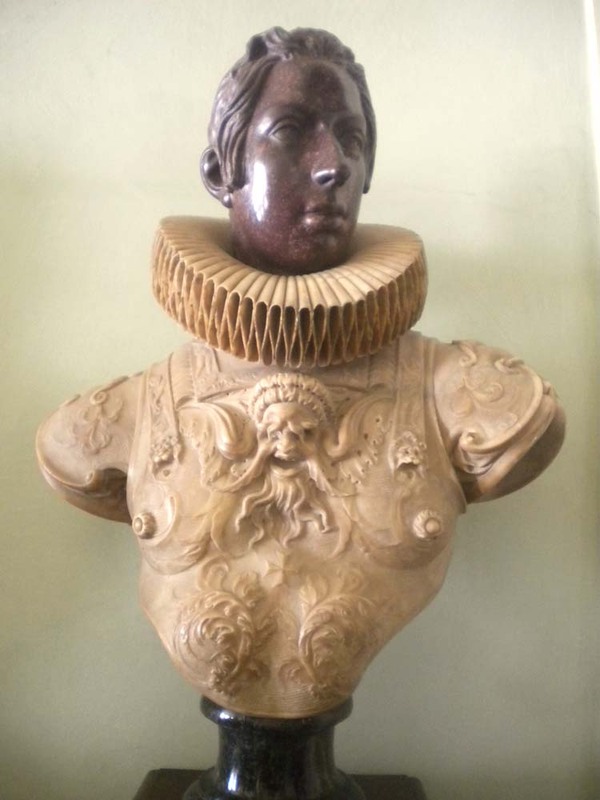 Note how much more detailed the carving on the marble chest is than the porphyry head on this bust of a late Medici. The ability to carve porphyry was eventually recovered, and in the 18th century Roman relics were transformed into large numbers of sculptures, especially busts, of rather questionable taste and quality. Porphyry remains hard to work with, so the very subtle curves and scratches necessary to make a really lifelike human portrait are simply impossible in it. Its products are always a little too smooth and shiny, the edges of the eyes clumsily cut, the wrinkles a little too smooth, like waves rather than folds. Also, purple with speckles is not the most flattering skin tone. Fake porphyry was, naturally, an industry as well, and many of the most famous buildings in Europe contain not only real porphyry but painted fake porphyry, made of plaster or wood painted with the signature purple and speckles. This was most often done for bases on which statues sat, or for trim around rooms, but the Villa Borghese in Rome contains whole tabletops of fake porphyry, with real porphyry busts nearby to make them plausible. Porphyry was also a popular ingredient in painted scenes, especially paintings of imagined palaces, and of places intended to be ancient Rome. And heaven, of course. The halls of Heaven, where saints and angels pose for altarpieces, have plenty of porphyry. Another few points to make. Your knowledge of how the beauty of Imperial Rome was used and re-used and perhaps abused and ignorantly used is so well displayed in the head and shoulders picture of the emperor Vespasian. Look him up as images of Vespasian. We share the anger in the way the ancient remains were treated. To Know by visual artists colored pictures of the floor of the Basilica Julia, with giallo antico marble, pavonazetto, and all around borders of africano marble, or, perhaps I have switched it around. We will never know for sure, as it was all removed. Paper-weights, or memories of the trip to Rome, or a Pope. The Temple of Concordia in the forum, had the entire floor of opus sectile stolen. 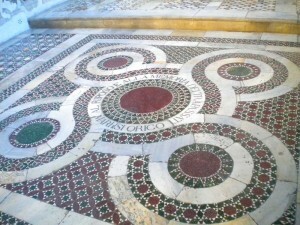 again the marble I mentioned above, the portasanta marble threshold is supposed to still be there. Porphyry takes a very glassy polish, diamantine like polish. I am troubled when I see the four columns of porphyry in the Hagia Sophia in Istanbul looking so dull and greasy dirty looking. I was impressed by your anger towards the abuse the ancient city has had to take. Look to the earthquakes the city had to endure. The quakes brought things down. 450ce, 847ce, and 1349ce, this gives great insight as to what caused,,,,,, Thank you for listening to me, Michael. Hello , I am an antiques dealer in Belgium and I adore Egyptian Porphyry . I have visited the Villa Borghese several times and there is no fake Egyptian Porphyry present in this place . The table tops you are mentioning were made by Luigi Valadier in 1773 . Veneer of re-used Egyptian Porphyry pieces glued on tufo or peperino tops and placed on marble supports . What we do see for the moment is that the art market is flooded by fake pieces made out of porphyry . You name it and they make it : columns , mortars , cosmati , busts or table tops . The only thing I cannot figure out is where they get the raw material that resembles for 80 % to the genuine Egyptian Porphyry . Ciao . I am a jeweler seeking a piece of porphyry for a signet ring – to be carved into a crest. 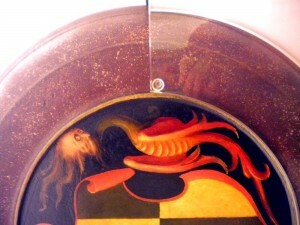 MY client preferes the red or purple color, and we need a fine grained piece for carving. It’s extremely rare, since the mine is now a protected UNESCO world heritage site and it’s no longer legal to extract new stone. I have a small piece which was a gift from a bishop, which I use for teaching purposes and intend to gift to a museum someday, but individual pieces are very rare. My recommendation would be to see if you can find a single separated mosaic tile piece, perhaps through an antiques store (or occasionally ebay). I would also recommend, if it isn’t totally against your client’s desires, to leave the porphyry itself untouched since every piece that exists is now an important historical relic, so it seems a shame to damage one. You could instead set it within a ring and have the crest be part of the setting, and thus preserve the history while also joining the porphyry to the image. This would match the way porphyry was often used by popes and emperors, so there’s a great tradition. I have a large amount of imperial porphyry slabs and slabs of it brought directly from the eastern desert. They’re not for sale as I’m cutting them into small tiles to cover an entire bathroom. I will give you a piece happily but can you also make me something ! 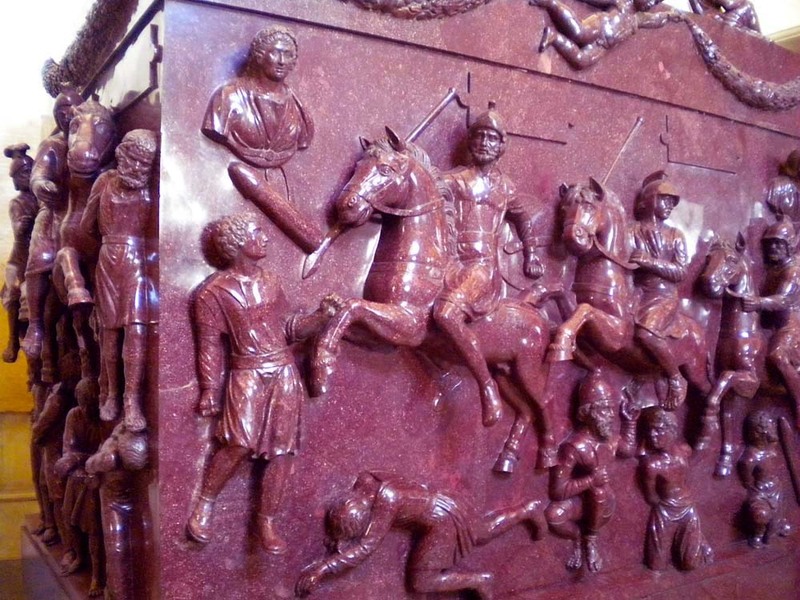 Napoleon’s tomb is made of red porphyry and is quite large. Yes, he rediscovered the mine so was the first person since the Caesars with an unlimited supply of Porphyry. It is made of a red aventurine quartzite quarried in Sweden. Very similar to porphyry though. I have discovered an outcrop of red-purple porphyry in Arizona. I have known about it for some time, but did not know others are seeking it. It isn’t quite as dark as the Imperial, but it is close. I am not looking to get rich, but would like something for my effort. E-mail me at danwelch59@yahoo.com and will send you a photo of some of it. I have a 10″ saw, but no polishing equipment. Can provide it rough or cut, by the pound. USPS flat rate shipping works great for this………. I discovered your blog while Googling porphyry. I became enamored with the material after seeing Napoleon’s tomb on vacation. This was very interesting and engaging to read. Thank you! I really enjoyed it and will explore more of your writing after I get over my sadness that owning a piece for jewelry is probably not going to happen. Ha! Just wanted to let you know that this website seems to have lifted entire paragraphs and posted them without attribution. Lapis Lacedaemonius is NOT serpentine. These are two completely different stones created in completely different ways. Serpentine is not hard, for one thing. Just cause they are both green does not make them the same! Does anyone know the geologic age and history of the porphyry? What geologic formation is it associated with? Porphyry is an igneous rock, as are granite and basalt. They are being formed all the time, basalt is being formed now in Iceland and the granite of Dartmoor, (Cornwall, UK) was formed long ago. Charlemagne was crowned Holy Roman Emperor on Christmas Day, 25 December, 800 CE. Not on Easter.